the ovoid vessel with cylindrical neck and wide cup-shaped mouth, applied with a pair of dragons coiled around the neck and biting at the rim, the sinuous bodies of the dragons arched to form handles, the high rounded shoulders of the vase applied with numerous different moulded ornaments including dragon medallions, tasseled ﬂorettes, stylized palmettes and a pair of large foliated lion masks, covered overall with a translucent glaze of pale greenish tone showing a ﬁne crackle throughout, generously applied and ending unevenly low on the sides, the ﬂat base also unglazed revealing the white stoneware body. Many examples of this shape of amphora with dragon head handles are known in various museum and private collections, but it is extremely rare to see full detailed dragon bodies coiled around the neck and such elaborate applied decoration. No other amphora of this complex design has been previously published. A Tang straw-glazed stoneware amphora of slightly larger size with the more typical double-stranded simple arched handles ending in dragon-heads, in the Nezu Art Museum, Tokyo, is illustrated in Sekai Toji Zenshu (Ceramic Art of the World), Vol. 11, Sui and T’ang Dynasties, Tokyo, 1976, p. 131, no. 113. Compare the Tang glazed white amphora of smaller size, with simple dragon-head arched handles with ﬂoral appliqués on the body and on the neck, in the Palace Museum, Beijing, illustrated in Gugong Bowuyuan Cang Wenwu Zhenpin Quanji, Jin Tang Ciqi (The Complete Collection of Treasures of the Palace Museum, Porcelain of the Jin and Tang Dynasties), Vol. 31, Hong Kong, 1996, p. 173, no. 159. 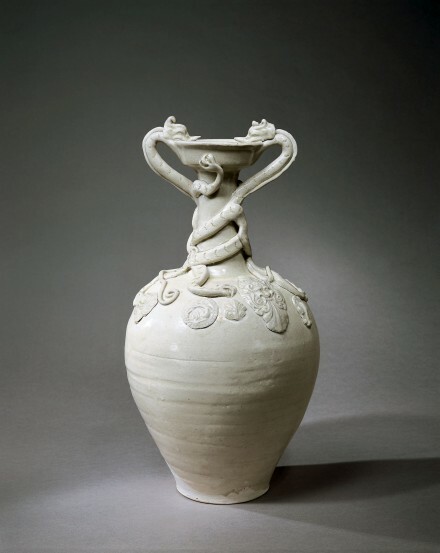 Compare also the straw-glazed stoneware candlestick with twin dragons coiled around the stem and applied with petals and palmette motifs, in the Collection of the Cleveland Museum of Art, illustrated by Watson in Tang and Liao Ceramics, London, 1984, p. 46, no. 26.